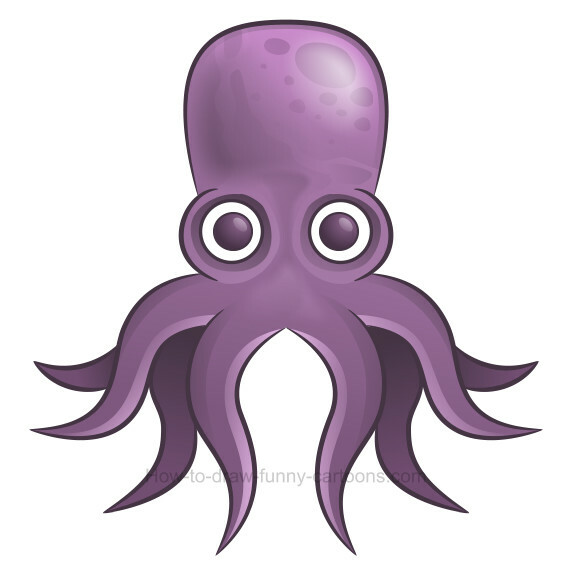 Learn how to create a simple octopus clip art and then see how adding more details, shadows and reflections can make this illustration even more beautiful and realistic! 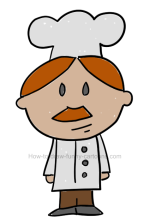 Clip art images are usually very simple to draw, but how can we turn a simple illustration into an appealing and more realistic image? Before answering this question, we need to sketch the basic character itself. And before sketching this animal, it can be a good idea to learn a little bit more about it. 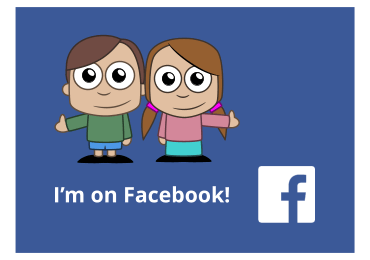 Let's use the illustration above to complete this exercise! 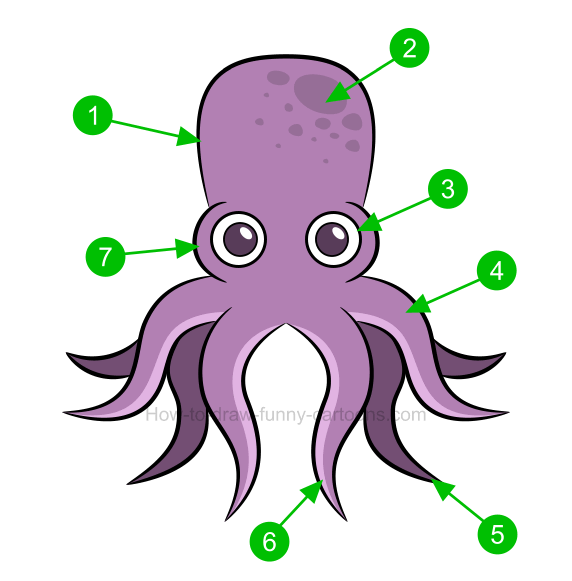 The head of the octopus is made from a large oval shape. Several patches can be found on the forehead. Eyes are large and made from perfect circles. 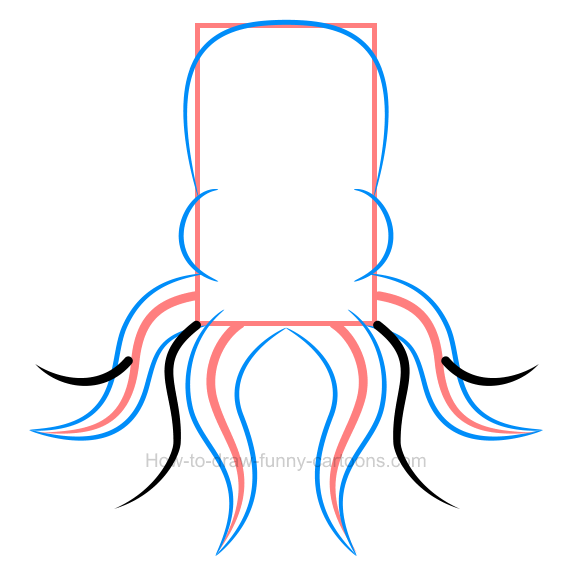 Tentacles are done using long curved lines. The end of each tentacle is pointed and sharp. These tentacles are filled with two different colors. Notice the shape of the head near the eyes. Cool! 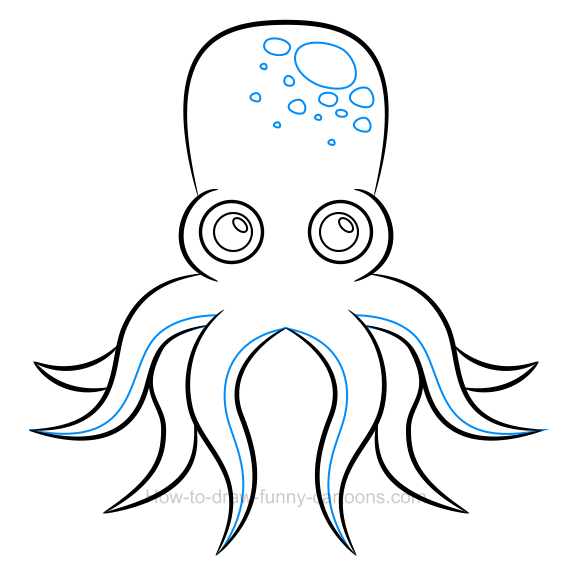 We now have enough information to start sketching this cartoon octopus using mostly basic shapes and lines. Ready? Let's draw! Before adding beautiful shapes and lines, it's a good practice to sketch basic shapes to create a template to work with. Not only it will be easier to achieved our character, but it can also help ending up with accurate proportions. 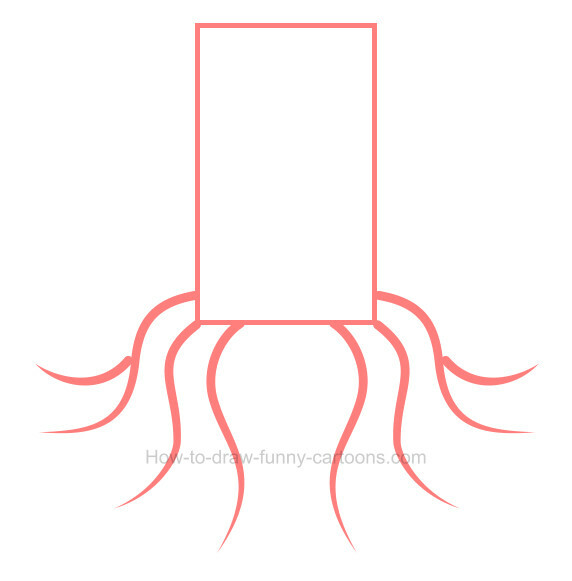 For this animal, a rectangle can be drawn to illustrate the head and body while lines are sketched to form the tentacles. 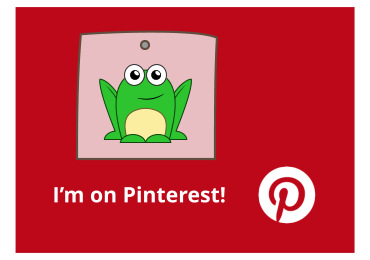 We now have everything needed to draw this octopus clip art quickly and easily! First, sketch the head using three long curved lines as shown below. 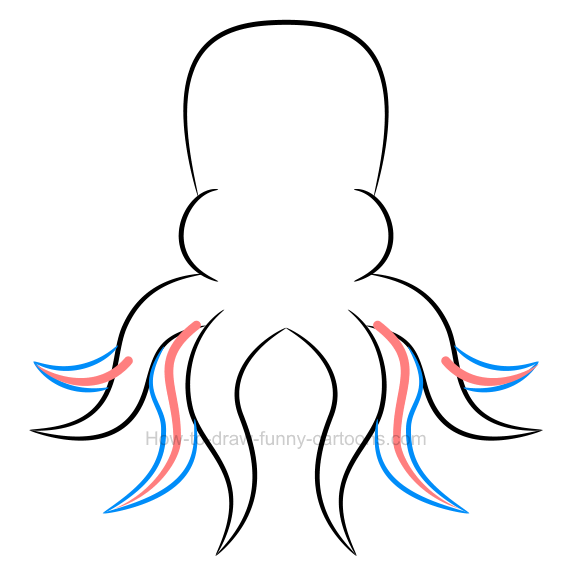 The front tentacles are made from more curved lines. You can erase all orange lines and keep the black ones for the next step. The large black lines found in the previous step are now orange. You can use these lines to draw the tentacles found behind the animal. Once again, simply erase these orange lines when you are finished drawing. Inside the head (which can also be described as the body), draw two large circles to represent the eyes. Both pupils are made from more circles that must be slightly smaller. 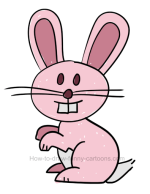 You can also add small reflections using oval shapes as shown below. 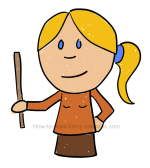 On top of the head, you can draw several small patches using irregular shapes (mostly circles and oval shapes). In this case, I have drawn one large patch and several smaller ones. 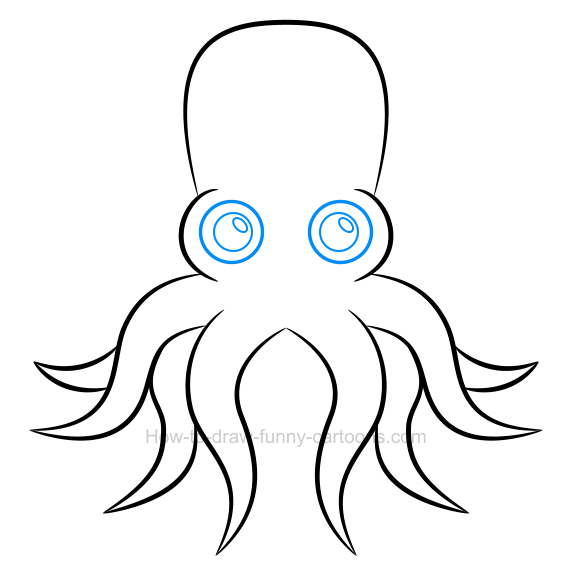 You can also sketch stripes on all four tentacles located in front of the octopus clip art. 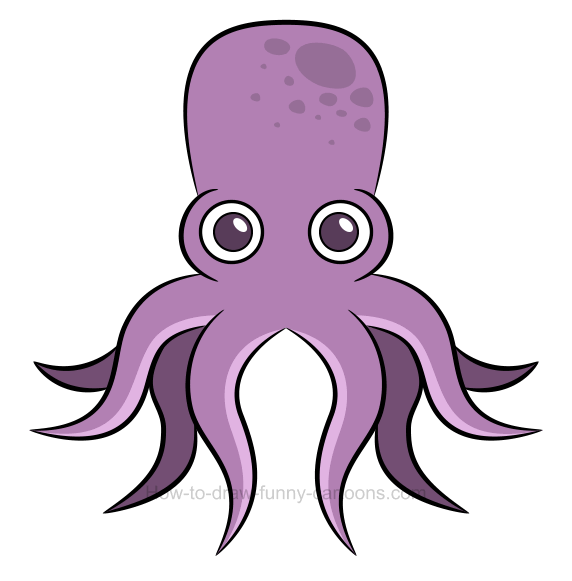 This cool cartoon octopus is mostly filled with purple colors. 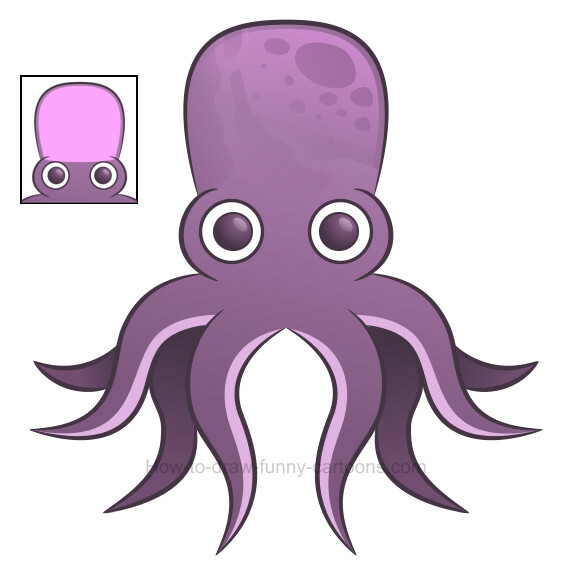 All patches found on the forehead can be darker, just like the tentacles located behind the animal. Pupils are also filled with a dark purple color and stripes found on the front tentacles can be brighter. 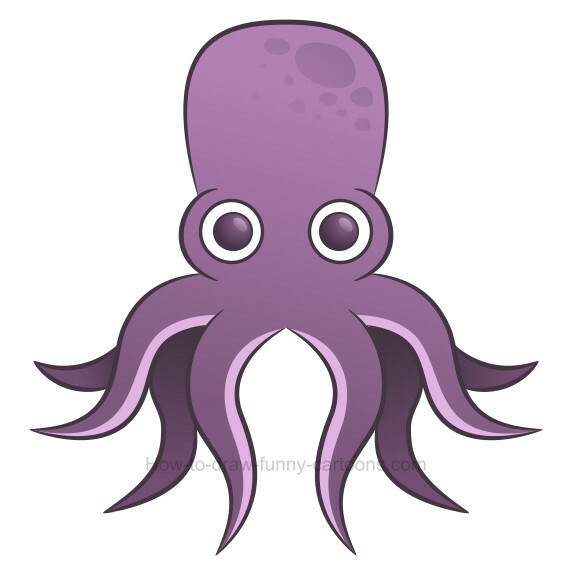 How to make this octopus clip art even better? 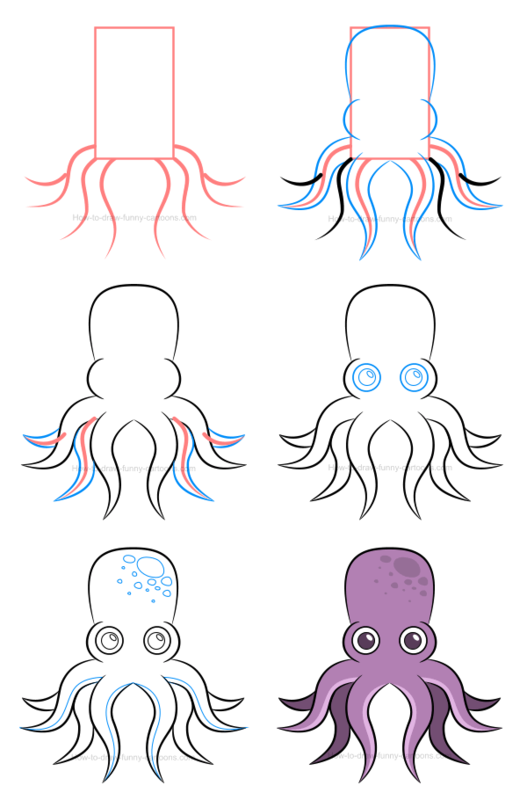 Below you can see all six steps required to illustrate this octopus clip art quickly and easily. Yes, it can be a challenging character, but if you stick to it and practice as often as needed, you can do it! 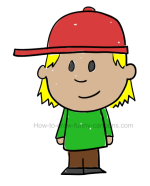 Now that the clip art version of this character is completed, let's see how we can add details to make this one visually more exciting. 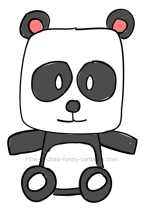 In the previous step, the animal was filled with basic plain colors. 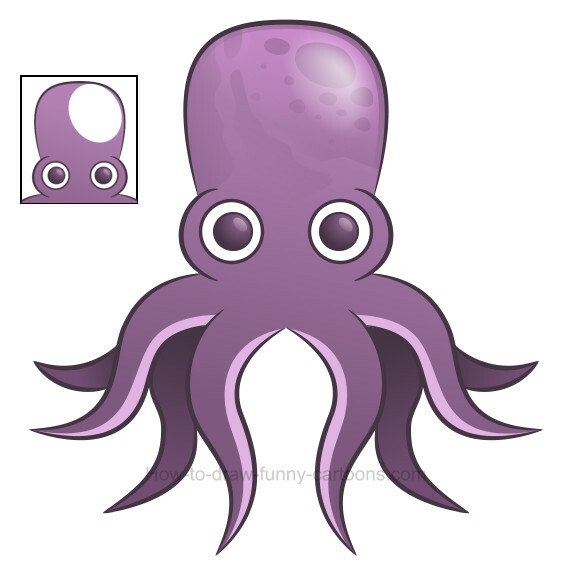 One thing we can do to make this octopus more realistic is to use gradient colors to create more depth. Notice how the bottom of the body is darker than the top? How the tentacles on the back are darker on top? That's the beauty of adding simple gradient colors to a character! 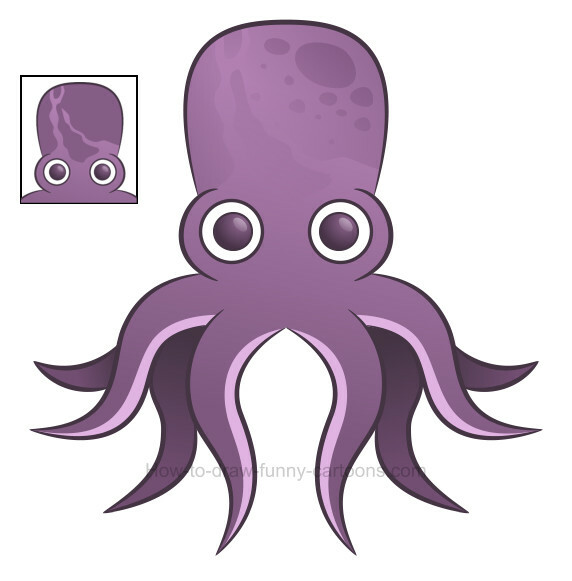 Inside the head of the octopus clip art, you can draw dark patches as shown in the small thumbnail on the left of the character. Using transparency, you can now blend these shapes into the forehead and create beautiful textures that look amazing and genuine. Another nice technique to make this illustration even more enjoyable it to add reflection on the forehead using a bright pink shape. Simply duplicate the forehead, add a bright pink color and apply transparency on the bottom of this new shape to create the effect. even more reflection to complete this effect! 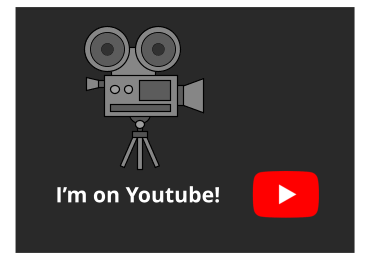 Once again, you can add another bright shape on the right of the forehead as shown in the thumbnail. Using transparency, you can achieve a special effect that makes this head shiny and visually appealing. darker areas are also needed! 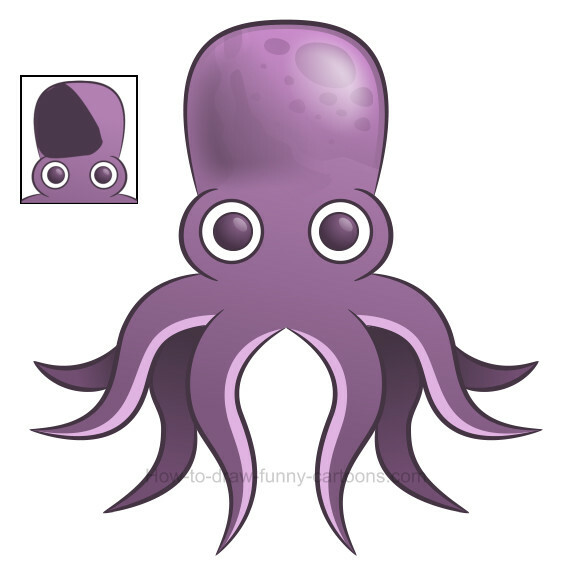 The technique used to create refection on the forehead of the octopus clip art can also be used to create strong shadows. In this case, a dark shape is drawn on the forehead and transparency is used to partially hide the shape. Unlike the previous shapes, only the top of the shape needs to be transparent. More shadows to complete the character! Now that you are familiar with the technique used to create shadows and reflections, you can complete this lesson by adding more effects around the eyes, on the tentacles and on the body.